We The sacred Himalayan town of Haridwar represents a living lesson on Hinduism. Located at the foot of the Shivalik Hills, the town attracts hordes of tourists and devotees from all corners of the world. Haridwar also holds significance because it stands as the gateway to the chardham, which includes Yamunotri, Gangotri, Badrinath ji and Kedarnath ji. Haridwar finds its mention in the ancient Hindu epics and scriptures as 'Mayapuri', Mokshadwar' and 'Gangadwar'. Geographically, it is at Haridwar where the sacred Ganga enters the northern Indian plains. During the Kumbh Mela (held at the interval of every 12 years), the population of the town swells up to millions. The next Kumbh Mela and the Ardh Kumbh Mela (held at every 6 years) are scheduled to be held in Haridwar in 2022. Today, Haridwar is seen as a mystic centre for the rejuvenation of the body, mind and soul. 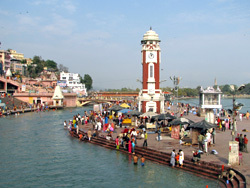 Also known as Har ki Pauri, it is the centre of attraction in the pilgrimage town of Haridwar. Devotees gather here to take a holy dip in the Ganges and to offer prayers. The celebration Ganga Aarti is a sight to behold here for tourists. The aarti ceremony takes place here every evening at 7 pm. As the river Ganga is worshipped, hundreds of diyas are set afloat along the river. According to Hindu mythology, Har ki Pauri is the place where a drop of the nectar fell from the moiling oceans, when the world came into existence. The ashram is both ancient and much popular. The words Sapt Rishi is a combination of sapt (seven) and rishi (sage). According to the Hindu traditions, it is the place where the sacred Ganga split herself in seven streams to prevent any disturbance to the seven sages (Kashyapa, Vashisht, Atri, Vishwamitra, Jamadagi, Bharadwaja and Gautam) who were deeply absorbed in meditation. A 5 km drive from Har ki Pauri takes you to the Sapt Rishi Ashram. Dedicated to goddess Maya Devi, the temple is a major attraction for all visitors to Haridwar. The temple is counted as one of the shaktipithas in India. According to the Hindu mythology, it is the place where the heart and navel of goddess Sati fell down, while Lord Shiva was carrying her burnt body. The heart and naval of Goddess Sati fell at the spot where Maya Devi Temple was built. Numerous festivals are held at the Maya Devi temple in keeping with the customs and traditions. The temple is worshipped as an embodiment of shakti or power. 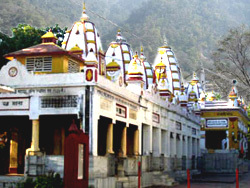 The temple is located to the east of Har ki Pauri and is easily accessible by buses and auto rickshaws. 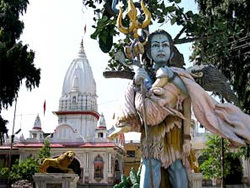 It is regarded as a must visit for devotees going to Haridwar. The temple is visited by many devotees from various parts of the country especially during the Navratra and the Kumbha Mela in Haridwar. 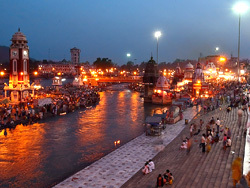 Lakhs of tourists arrive in Haridwar during the Kumbh Mela, held at the interval of every twelve years. Devotees and pilgrims arrive here to purify their sould by taking a holy dip in the divine water of the Ganges. 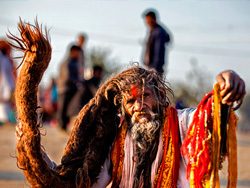 The highly revered Kumbh Mela begins when the plante Jupiter enters Aquarious and the Sun enters Aries. The tank is held in high regard by the whole Hindu community. As per the Hindu mythology, the Bhimgoda Tank was created when Bhim, a legendary character of the Hindu epic Mahabharata, hit his knee against the ground while the Pandava brothers were heading towards the Himalayas. The tank occupies a position at a distance of 300 m from Har ki Pauri in Haridwar.